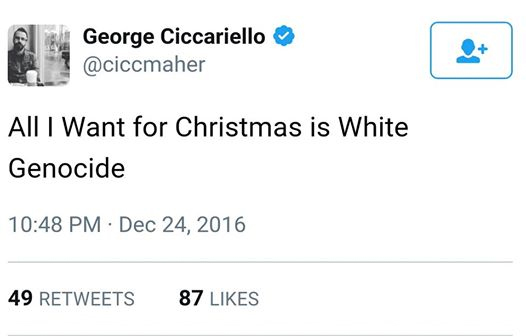 Professor George Ciccariello-Maher of Drexel University channeled a different kind of Christmas spirit when he tweeted out “All I want for Christmas is White Genocide.” The tweet was published on Christmas Eve. The politics and global studies professor didn’t end there. “To clarify: when the whites were massacre during the Haitian revolution, that was a good thing indeed,” he tweeted on Sunday. Ciccariello-Maher’s Twitter is not public, though there is indication that it was prior to Saturday night.